Union soldier John "McB" (Clint Eastwood) finds himself injured in Confederate territory. A young girl named Amy (Pamelyn Ferdin), is out in the forest picking mushrooms and stumbles upon him. He's near death and Amy takes pity on him and brings him back to her all girls school. The women are reluctant to help an enemy soldier but take him in anyways. At first their intent is restore his injured leg, bring him back to full health and turn him into the Confederate Army. But it's been a long war and they've been lonely. And it's nice having a handsome man around especially one as vulnerable as John. He takes advantage of their situation and starts seducing three of the women. The headmistress Martha (Geraldine Page) carries a dark secret with her and sees a dalliance with John as a way to reignite old passions. Then there is the modest Edwina (Elizabeth Hartman) who tends to John's leg and dreams of a romantic life outside the school. And then there is the more sexually aware Carol (Jo Ann Harris) who is not conflicted by her desires for an affair with the mysterious soldier and by the need to turn him into the local Confederates. Once the women discover John's true nature they turn on him. What follows is a downward spiral into what seems more like a fever dream than reality. 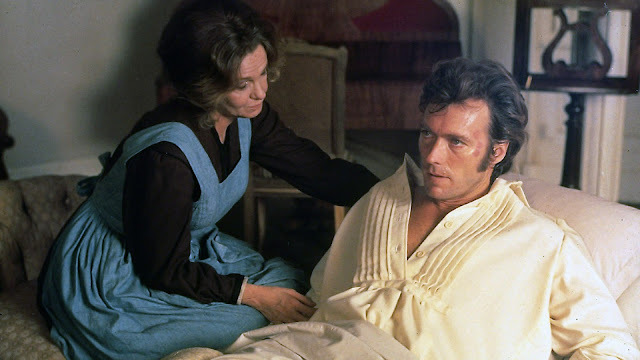 The Beguiled (1971) was directed by Don Siegel, produced by Clint Eastwood's production company Malpaso and distributed by Universal. It's based on Thomas Cullinan's novel published in 1966. 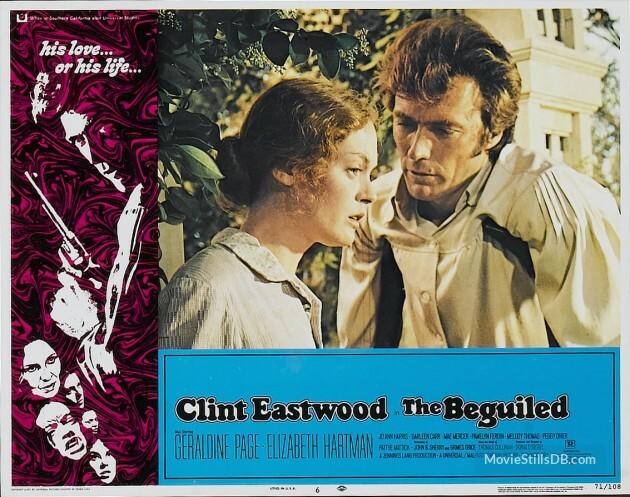 After the movie was released Cullinan followed with two additional novels The Besieged and The Bedeviled, both Confederate Civil War era stories. The film was poorly marketed as another Eastwood action film when it was really a psychological drama. As a result it did poorly at the box office. This film came to my attention when I heard of Sofia Coppola's new adaptation The Beguiled (2017) which releases next month. Intrigued by the film's concept, I went back to the original. And I've always been curious about Elizabeth Hartman who stars in one of my all-time favorite movies A Patch of Blue (1965) and this was a good excuse to watch more of her work. The Beguiled is a mesmerizing movie. It's dark and unrelenting. It's fascinating to see how the dynamics of relationships change during war time. The film has some great performances by Geraldine Page and Clint Eastwood in particular. There is a feverish quality to the movie that heightens the psychological drama. The film tests the waters of propriety in the way that many films did in the 1970s. Eastwood kisses the young Ferdin in a scene that is uncomfortable to watch. Some will see it as a kiss to keep her quiet as the Confederate soldiers march by. Others will see it as an unnecessary moment of inappropriate sexuality. There is also the them of inc-st in the movie. Martha, played by Geraldine Page, has a passionate and sexual affair with her brother who at the time of the story is missing in action and presumed dead. John discovers her secret and the audience is clued in to this with several flashback scenes. I'm curious to see if the new adaptation incorporates these scenes from the original. I also wonder if they'll do away with the slave character Hallie played by Mae Mercer. She's a strong female character who fights back but depiction of slaves on film is always problematic territory. If you're at all interested in seeing Sofia Coppola's version of The Beguiled, I highly encourage you to try the original too. I rented the film from DVD Netflix and it's currently available on DVD and Blu-Ray. Below are the trailers for the 1971 and 2017 versions. Listen to me discuss The Beguiled (1971) on the Our Friends Said They'd Listen podcast.